A new survey from UBS suggests that the Apple Watch could get off to a strong start, leading the investment firm to predict sales of 24 million units and gross profit of $3.4 billion from the wearable device in its first few months alone. 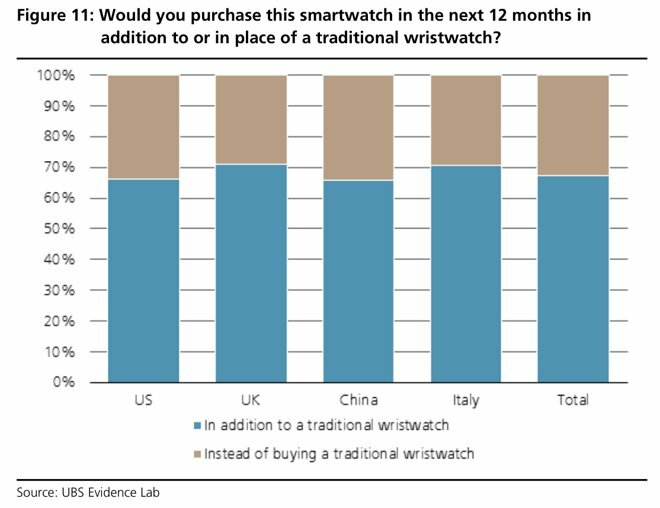 In its poll of 4,000 consumers, UBS found that 10 percent of consumers said they are "very likely" to buy a smartwatch in the next 12 months. Applying that same percentage to the total number of eligible iPhone owners, UBS believes Apple will sell 24 million Apple Watches in its first nine months of availability. Detailing the results in a note to investors on Monday, analyst Steven Milunovich noted that the first version of the Apple Watch has a number of limitations, most notably its dependence on a connected iPhone for functionality. But he believes the first-generation device will set up Apple for long-term success in the wearables market. Still, in the first few months, Milunovich believes Apple will sell 24 million of its Watch with an average price between $420 and $430. That would result in sales of $10.3 billion, and with an assumed 33 percent level of gross margin, would add $3.4 billion in profit to the company's bottom line for fiscal 2015. Apple's fiscal 2015 concludes at the end of September, so Milunovich's estimates don't include the 2015 holiday shopping season. Looking to fiscal 2016, Milunovich's estimates increase to 40 million units, resulting in $17 billion in sales and $6.2 billion in profit. And by 2018, his projections call for Apple to be selling 67.6 million Apple Watch units in a single fiscal year. The analyst said it's likely that the iPhone and Apple Watch will prove to be complementary products, much like the Mac and iPad. But he said it's also possible that the Apple Watch could eventually become the successor to the iPhone. "Given that two-thirds of Apple's profit is generated by the iPhone, the company has to be concerned about the longer-term threat of replacement technology, whether it be a leap in handset technology or loss of key functions to wearables," Mulinovich said. "With a sophisticated user interface and third-party apps coming on, Apple may be readying for the time when the Apple Watch encroaches on the smartphone market." The UBS survey also delved into specific brands, and found that for now consumers are more interested in the currently available Samsung Gear. 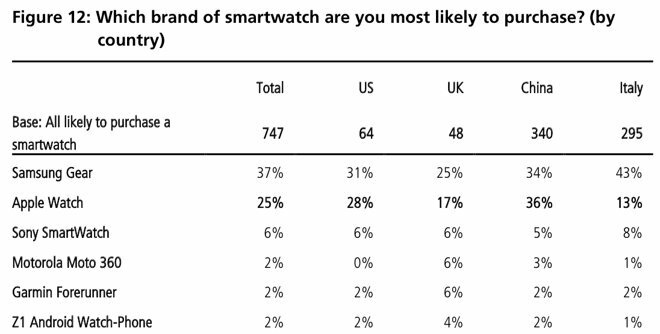 Among respondents who plan to buy a smartwatch, 37 percent said they would purchase a SamsungGear, while 25 percent said they are waiting for the Apple Watch. Milunovich expects the tables to quickly turn in early 2015, when the Apple Watch becomes available and shakes up the existing wearables market. "Just as Apple wasn't the first MP3 or smartphone vendor but redefined those categories, we expect Apple Watch to become first to mind in smartwatches," he said. UBS has maintained its "buy" rating for AAPL stock with a 12-month price target of $125.